This remarkable machine is a conventional motor car that can easily and rapidly be converted into a motor sleigh for reliable progress on snow. The make of car is unknown, but the convertible mechanism was the brainchild of Lieutenant de la Besse. A first attempt by de la Besse was built on a 5cv vehicle, and at the Grand Winter Week organised in January 1909 by the ACF and the Touring-Club at Chamonix won the Grand Prix against competition from others of this type. 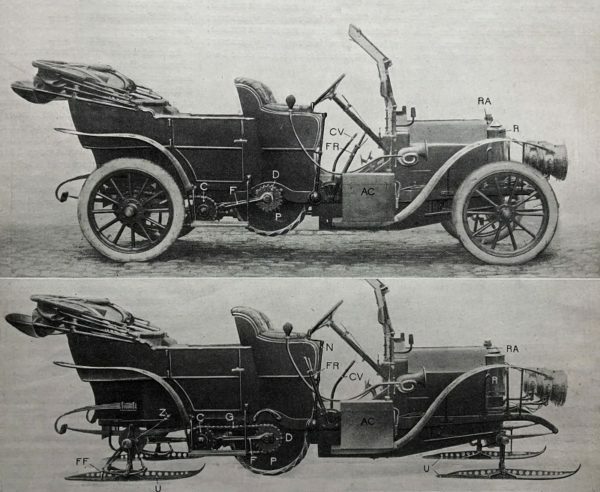 The vehicle in our Snapshot was a much-improved version, now built on an 18cv chassis, due to compete at the 1910 Grand Winter Week, in that year to be held at Gérardmer. A magazine review was impressed with the fully developed machine, in particular its ability to be transformed rapidly between normal car and highly effective motor sleigh. It was reported that M. de la Besse left Paris on 30 January 1910 with three passengers and all the skids to replace the wheels, stopped at Fayet to swap, and reached Chamonix by a snow-covered route. The de la Besse machine had two large toothed driving drums (marked P in the photographs). The helical form (like the two separate halves of a double-chevron gearwheel but with only a slight angle from direct drive) pushed snow sideways to stop build-up, and ensured continuous drive – one tooth coming into use before the previous one had lifted. Adjustable torsion bars allowed the driver to change the pressure on the driving drums to cope with varying snow quality, and to retract the drums completely when converting the vehicle back to normal wheeled operation. The machine was clearly designed to work in cold climes (it was to be demonstrated in Russia immediately following the event in Gérardmer), so particular care was given to protecting the engine and its drip-feed lubricator from the effects of extreme cold. Visible alongside the radiator and marked R in the pictures was a petrol-fired boiler that circulated hot water through the engine and around the lubricator whenever the vehicle was stopped outside in cold weather. The challenges of braking in snow were not forgotten. The differential on the drive drums could be locked and the drums stopped to give initial retardation, and two pairs of crampons (marked FF in the lower picture) were attached to the rear skids and could be dropped to give additional braking. This machine is a rarity, but the concept is not: there are several pictures of similar vehicles used in Europe and America. But this appears to be one of the few with truly rapid convertibility between wheels and skids. Sadly, nothing is known of the eventual fate of Lieutenant de la Besse or his invention.